Before we left Somerset this morning, we stopped by the Walmart Supercenter in Somerset to stock up on sodas and snacks, so we didn't get underway until 11:05. The weather was sunny and chilly, with puffy clouds. Driving across the Allegheny Mountains is quite interesting because it requires passing through several tunnels. The scenery was very pretty, with rolling hills, some larger, more imposing trees, and quite a bit of fall color. 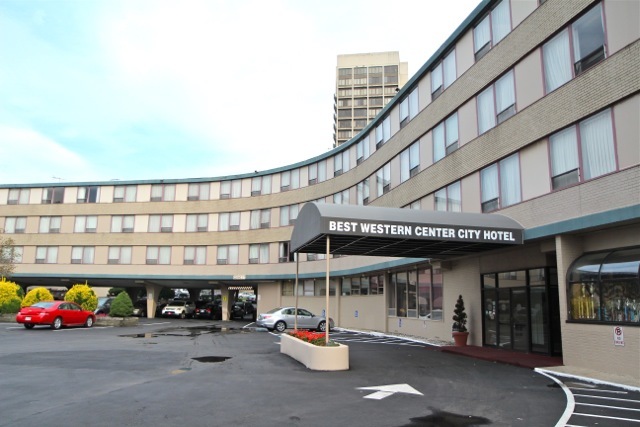 We arrived at the Best Western Center City motel in Philadelphia at 3:20. We have stayed at this hotel twice before. 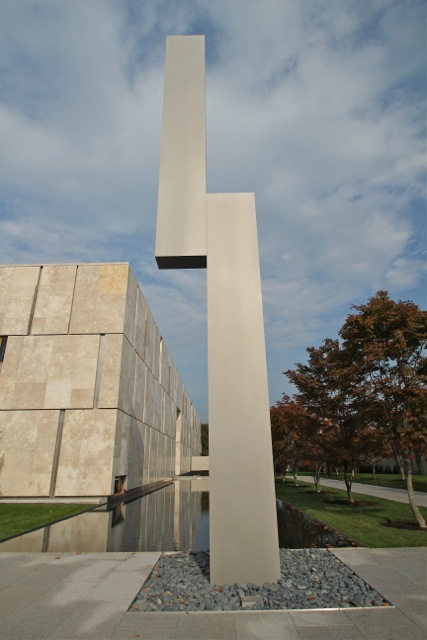 It is a little run-down and the staff is a little careless, but it is located near the Philadelphia Museum of Art and within walking distance of the Rodin Museum. 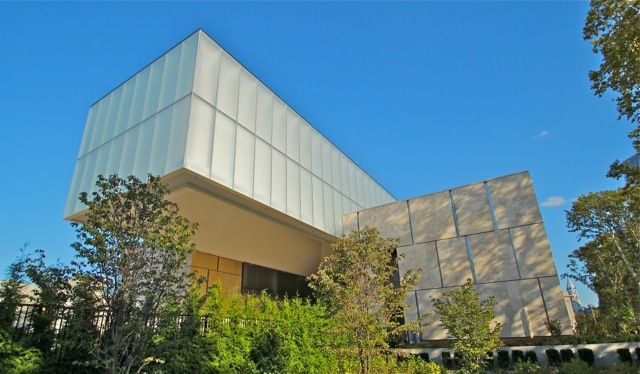 We were delighted when they decided to build a new museum for the Barnes Foundation less than two blocks away. 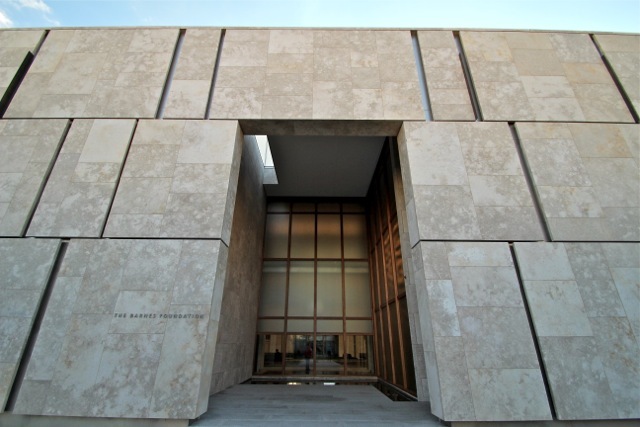 The Barnes Foundation had a legendary collection of post-Impressionist art, but it was not much visited because the museum was located in Merion, PA, a township bordering on Philadelphia. The museum had been purpose-built by the man who collected the art, Dr. Alfred Barnes, and he had arranged every item in it according to his personal inspiration. His will specified that the museum must remain unchanged in perpetuity. Because of financial difficulties, it was decided, after much wrangling in court, that the museum could be moved into the cultural district of Philadelphia if the original museum could be replicated. 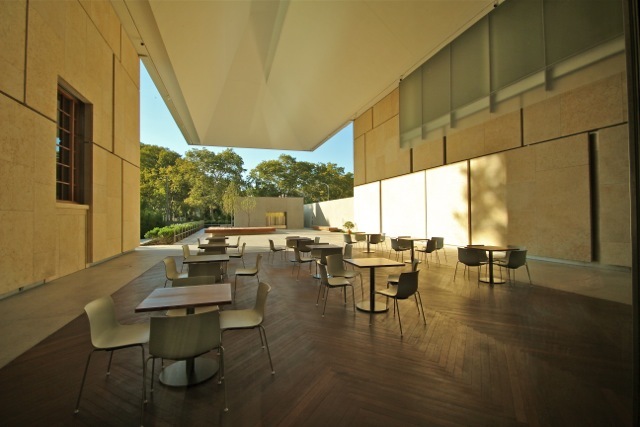 Dan and I had been wowed when we visited the Barnes in Merion several years back, and we had followed the news on the court case, and later on the architectural design. As soon as the new museum opened, Dan started planning this art journey, and as soon as we got settled in our hotel, he wanted to walk over to check it out. It was after 5:00, and our advance reservations were for Wednesday, but he thought he might get some exterior photos. The temperature was nice, so the walk was pleasant, and there was still a lot of light, so Dan got a good picture of the back end of the building. By the time we got around to the front, clouds were gathering. 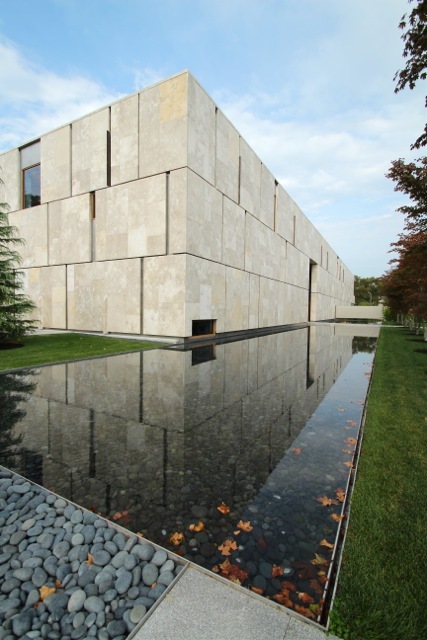 The back end of the Barnes Foundation. The white section is a translucent sky-light over the grand entrance foyer. The fortress-like entrance is hidden down a walkway and protected by a mote-like reflecting pool. Is this an allusion to the somewhat "hidden" quality of the original museum's remote location? The museum is open until 6 p.m. and visitors are allowed in the foyer, so we eagerly had a look around. 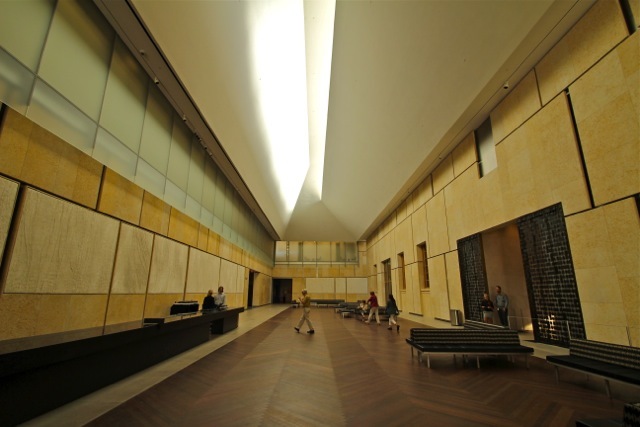 In the tradition of the Great Hall in many traditional museums, the foyer is monumental in scale—a vast space with a lofty sky-light running it's entire length. The monumentality is accentuated by the simple shape of the space, the use of stone facing on the walls, and the division of the walls into over-sized rectangles. The Great Hall; entrance to galleries on the right. Courtyard of the Barnes; it was closed to the public during our visit. Visitors were also allowed to descend into the basement to visit the Gift Shop. 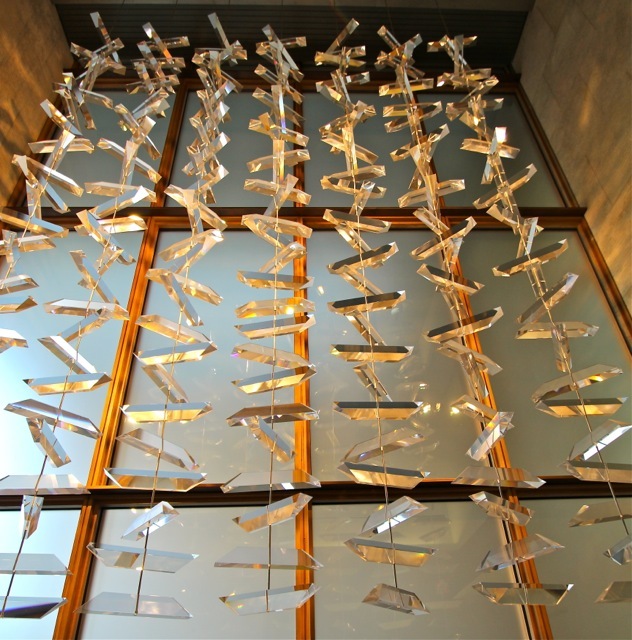 The stairwell was decorated by a lovely screen made of shards of crystal strung like beads; it was designed by the architects for that location. Dan took advantage of the opportunity to buy the Foundation's big book on their collection, and I purchased a few souvenirs as well. Then we took the stuff back to the motel and stowed it the car. For dinner we were eager to return to The Belgian Café, where we had eaten a few nights on the previous trip. It is only about six blocks from the hotel, so we walked up there. As in the past, our meal was stellar. We both had tilapia in a gourmet preparation. Dan also had mussel soup and Belgian chocolate mousse.